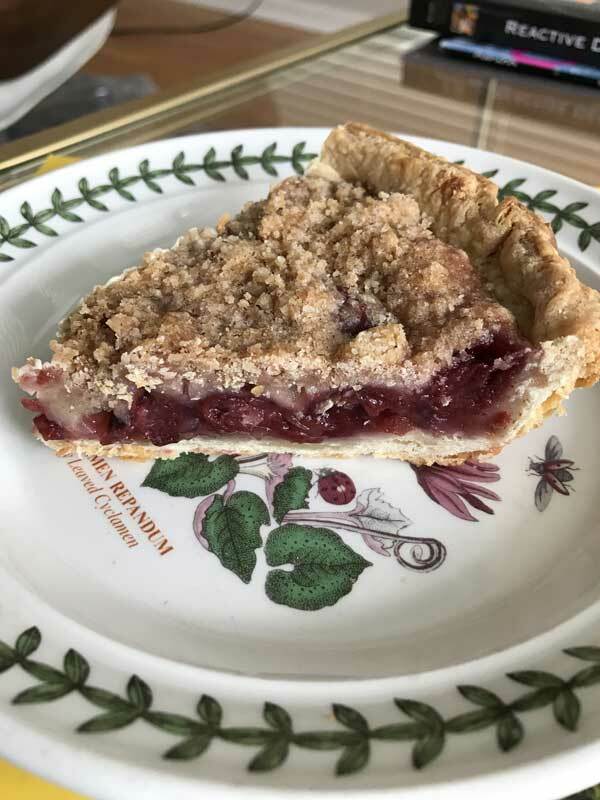 If you have box of Minute Tapioca in the kitchen and want to try using it in a fruit pie, this vintage Minute Tapioca Cherry Pie from The Vintage Recipe Project is a fun one. I found it while searching for ways to use tapioca since it’s generally not something I keep around, but had bought for a slow cooker dish. The recipe calls for sour cherries and their juice, but I used thawed frozen dark cherries (couldn’t find tart or sour) and they worked just fine. Next time I’ll seek out tart or sour or stick with the canned or jarred sour type from from Aldi or Trader Joe’s. There will definitely be a next time because cherry pie is a family favorite and I have the rest of this box of tapioca to use! I’m linking directly to the recipe so you can see the cool website and the other vintage recipe cards. As for the pie, let me know if you try it! Update: I made this pie again using Trader Joe’s Dark Morello Cherries. Here’s my new version. You can make it with a double crust or use the crumb topping pictured below and in the variation note. In the photo below I only made half the filling (used 1 jar of cherries) so the pie is shallow, but still good. Here’s a photo of the cut pie made with the crumb topping. I’ve actually made this a couple of times since originally posting the recipe and I always make it using one jar of drained Morello cherries rather than two. Using one jar, as I do, will give you a shallow pie with a high ratio of crust to topping. If you really need a bigger pie you can double the recipe and make it in a deep dish. 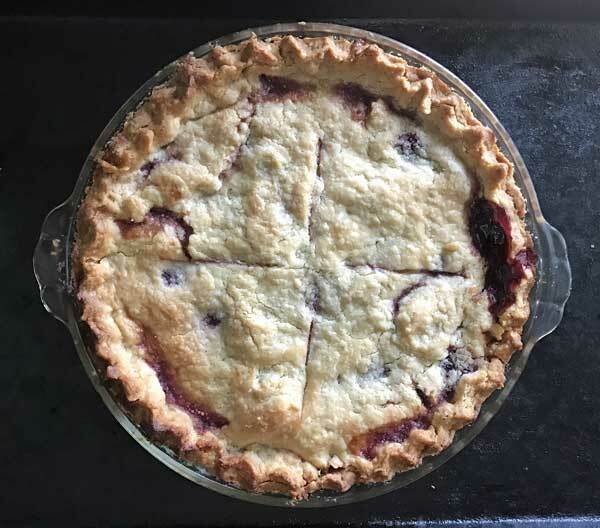 This is a pie I make with Trader Joe’s Dark Morello Cherries – the kind that come in a large glass jar. Aldi also sells similar cherries. 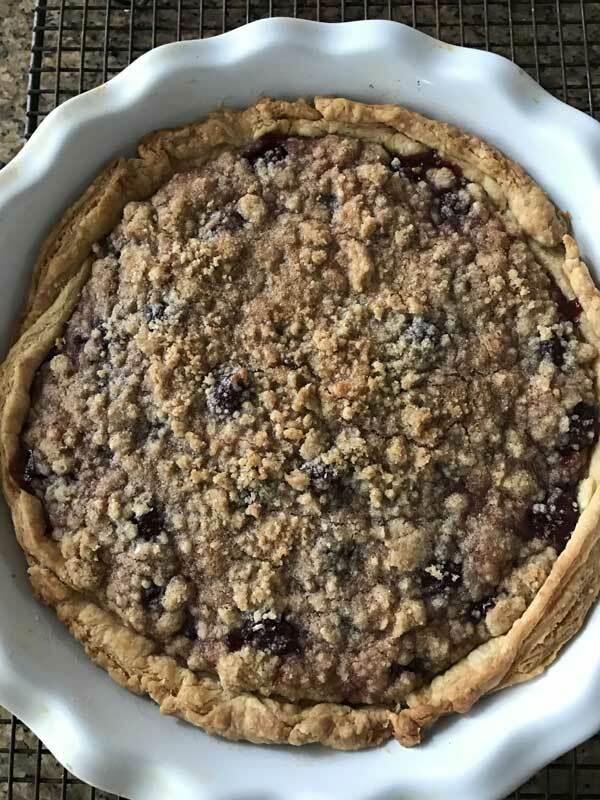 You’ll need one jar of cherries for a 9 inch shallow pie, but you can double the filling and make a deeper, higher fruit pie if you need to. Preheat oven to 400 degrees F.. Put a rimmed baking sheet in to preheat along with the oven. Have ready a 9 inch deep dish pie plate lined with pie dough. In a mixing bowl, stir together sugar, tapioca and salt. Add the cherries and toss to coat, then stir in cherry juice, almond extract and vanilla. Allow the mixture to stand for 15 minutes. Pour mixture into pie dish using only as much as needed (you may have more filling depending on the depth of your dish -- if you overfill, it will bubble over). Dot with butter. Roll out your top crust and lay it over, then seal edges and cut vents. Alternatively, use a lattice. Set the pie on the hot rimmed baking sheet. Bake at 400 degrees for 30 minutes. Reduce heat to 350 and bake for another 30 minutes. Let the pie cool for several hours, then chill slightly. Return to room temperature and cut. Variation: Instead of a double crust pie, use one crust and top with an easy crumb topping. Mix together 1/2 cup plus 2 tablespoons flour, 3 tablespoons brown sugar, 2 tablespoons white sugar, pinch of salt, 1/4 teaspoon of cinnamon. When thoroughly blended, pour in 4 tablespoons of melted and cooled unsalted butter. Mix until crumbly. 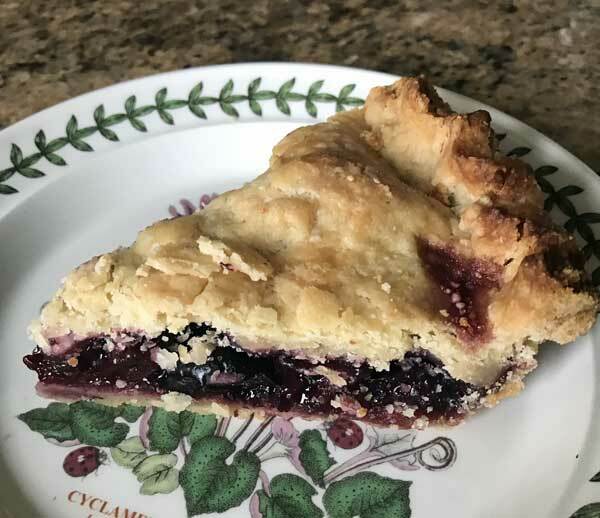 The Best Blueberry Pie Yet! If I liked peach more, I’d try those turnovers. And it’s weird about tapioca pudding. It doesn’t seem like something that would be hard to acquire a taste for, but for people who grew up on smooth pudding, it might be unsettling at first. Yum – how delicious and fun! I can relate to having that extra tapioca on hand with very few recipes to use it. The only recipes I have that call for it are the Peach and Ginger Turnovers from King Arthur Flour Whole Grain Baking, and the Lattice-Top Peach Pie from The America’s Test Kitchen Family Cookbook, both of which I won’t be making any time soon in March! But they are delicious recipes! For the peach pie, they say that you can also use potato starch. Anyway, I’m not much of a cherry pie person myself, but that was the other recipe I saw tapioca in, too. Maybe I should just make tapioca pudding with it – I do remember loving that as a kid!